PhotoModeler software has many capabilities and features that support the requirements of engineers, surveyors, and architects. Mechanical, civil and chemical engineers use PhotoModeler for a diverse set of measuring and dimensioning tasks. Surveyors use PhotoModeler to generate maps, volumes, cut/fills, and get key dimensions. Architects use PhotoModeler to generate as-builts, facade drawings, and assist with shadow, volume, and massing studies. View some examples and learn how PhotoModeler is measuring and modeling everything from surface models to power plants. For other examples in architecture and surveying, click on these words. This project was created by Sitag S.L. in Spain. 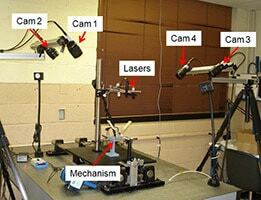 The project displays the industrial modeling capabilities of PhotoModeler. The subject is an electrical station. PhotoModeler is used to model the station structure as well as electrical towers and lines. The Cylinder tool was used to model various poles and pipes. Results were viewed and measured in PhotoModeler. 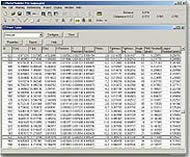 The project coordinate data was studied in PhotoModeler's Point Table and then exported to CAD for further examination. The project used a total of 11 photos and 734 3D points. This project was conducted by Eos Systems and shows the measurement and modeling capabilities of PhotoModeler in an industrial setting. The subject was a boiler area located in a small brewery in Surrey, British Columbia, Canada. The Cylinder modeling tool was used here to measure and model pipes on the boiler structure. The pipes modeled in this project can be measured right within PhotoModeler. Using the measure tool, information such as length and diameter can be retrieved. This project was created using a Kodak DCS 200 camera, with the resulting model using 13 photos and 75 3D points. The resulting model displayed is shown in PhotoModeler's 3D Viewer. The Object Properties feature allows you to add photo textures to surfaces, and colors to other objects such as cylinders, lines and points. This large and detailed project of a S211 aircraft from Italy was modeled by students conducting a study on the use of PhotoModeler for the purpose of reverse engineering. This project shows that with some planning, PhotoModeler is capable of modeling very complex objects. The airplane was pre-marked with stickers before taking photos. The grid-shaped stickers helped the students mark and reference matching points on the many curved areas. Using the point and line tools, a detailed model of the airplane body was constructed. PhotoModeler's Cylinder tool was used to help model the airplane's landing gear. Surfaces were added in PhotoModeler to complete the model. The project was completed by students at the Università degli Studi di Bologna, Italy. The final project consisted of 35 photos and 657 marked and referenced points. The folks at the Air Force Institute of Technology, Wright Patterson AFB are carrying out some fascinating work on MUAVs - Micro Unmanned Aerial Vehicles. 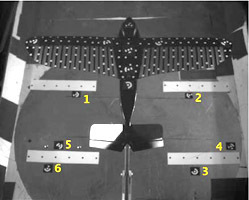 Captain Curtis developed testing methods for analyzing the performance of a miniature flapping wing mechanism that could later be adapted to a flapping wing micro air vehicle. He used a non-intrusive photogrammetry method employing laser dot projection and PhotoModeler Video to measure the shape of the wing during flapping. Approximately 100 data points representing wing shape and orientation were collected at 1000 Hz. Captain Curtis' Master's thesis, Laser Dot Projection Photogrammetry and Force Balance Measurement Techniques for Flapping Wing Micro Air Vehicles, describes this work in great detail. Captain Pitcher examined the static aeroelastic behavior of the Nighthawk MUAV wings using a combined experimental and computational approach. He used PhotoModeler Video during wind tunnel testing to measure the average deflected shape of the flexible and stiff wings during flight. Captain Pitcher's Master's thesis, A Static Aeroelastic Analysis of a Flexible Wing Mini Unmanned Aerial Vehicle, and the paper, Videogrammetry Dynamics Measurements of a Lightweight Flexible Wing in a Wind Tunnel, provide detailed information about these works. PhotoModeler and the PMV module gave Captains Curtis and Pitcher a powerful, accurate and non-contact tool for measuring 3D wing shape changes at video frame rates. For further information you can contact Dr. Jonathan Black, Dept. of Aeronautics and Astronautics, Air Force Institute of Technology, Wright-Patterson AFB.